A profitable holiday property business and period family home in a much sought after Scottish holiday hot spot has come to the market through CKD Galbraith. Portnellan sits at the foot of Ben More, just to the east of Crianlarich within the Loch Lomond, Stirling and Trossachs National Park. The sale comprises of Portnellan House, a wonderful late Victorian five bedroom, four bathroom family home and a selection of award-winning 4 and 5-star holiday properties all set within extensive mature and landscaped grounds with planning consent for a further 18 holiday properties. The holiday property enterprise was established in 1980 and has developed over the years since collecting industry accolades, the most recent nomination being VisitScotland's Thistle award as 'The Best Self Catering Accommodation' within the region. The business boasts an average occupancy rate in excess of 60 per cent and producing a healthy net profit. There are 15 delightful holiday properties which are either fully or part owned by the business or third parties. The business offers properties for sale on a shared or outright ownership scheme with a management structure to market and maintain the properties. Nine holiday properties are included within the freehold sale along with over 40 acres of ground, salmon and trout fishings and the development land which has planning permission for another 18 properties. Portnellan House itself enjoys an elevated position offering sensational views over the surrounding countryside, Loch Dochart, Loch Iuibhair whilst the famous mountain of Ben More and the Crianlarich Alps tower above the grounds. This traditional property has spacious accommodation over two floors and has been finished to a very high standard. Recently refurbished throughout, the house includes five double bedrooms with four bathrooms, a hand built Charles Rennie MacKintosh kitchen, a spacious drawing room, conservatory, beautiful dining room with its own bar area and a TV snug providing the ideal space to relax. Recent years has seen Portnellan House been offered as a high quality, 5-star holiday property that can sleep up to 10 people. Outbuildings include a double garage, workshop, wood store, reception and small visitors centre. "My family and I have spent several decades building Portnellan into a profitable quality holiday accommodation business. It is a truly remarkable location for a Scottish holiday and we receive a high number of repeat customers who come back year on year to experience the best the country has to offer." "Portnellan is a superb business opportunity ideally located in one of Scotland's most scenic regions. The self-catering holiday accommodation business has a very strong track record and would be the perfect venture for those looking to build on what is currently on offer at Portnellan and escape into Scotland's heart for a change of lifestyle. the sale has excellent development potential with planning consent already granted for an additional 16 holiday properties set within an architecturally designed Eco Village' and Clachan (this just means village and we have already stated eco-village) plus separate consent for two additional serviced plots. Also included in the sale are salmon and trout fishing rights on Lochs Dochart, Loch Iuibhair and two miles of the River Dochart. There is the potential to erect a boathouse facility as well." The quiet village of Crianlarich is only two miles to the west of Portnellan and is a popular location for tourists. Local amenities include a nursery and primary school, village store, hotel, pubs, restaurants and even a small railway station which is part of the famous West Highland Line. The bustling cities of Glasgow, Edinburgh, Perth and Stirling are all around an hour's drive away as are the picturesque towns of Oban, Fort William, Callandar and Aberfeldy. 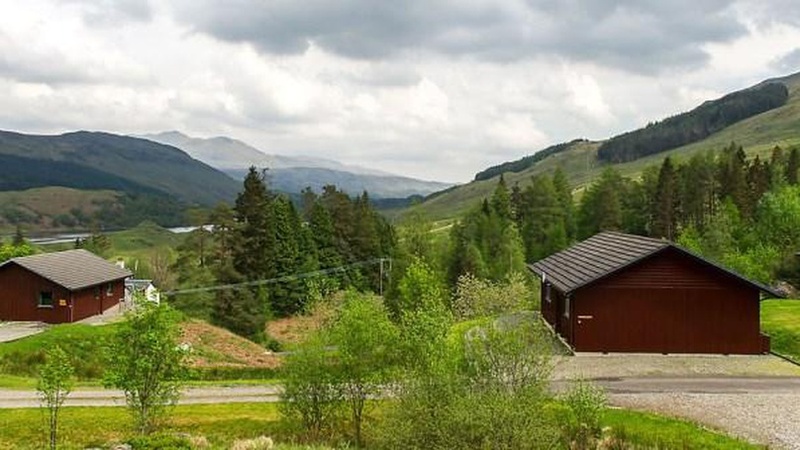 The area offers an outstanding range of outdoor pursuits throughout the year with water sports available on the nearby lochs, a number of challenging Munros in the local area for hillwalkers and an abundance of attractive low level and woodland walks also very accessible from Portnellan. The area is known for its hill stalking, horse riding, clay pigeon shooting, archery, white water rafting to name a few. The Winter sports resort of Glen Coe is approximately 40 minutes-drive as well as the Nevis Range which is just over an hour's drive offering both snow pursuits and the world known downhill mountain bike route. The property's current owner has been proactively marketing the self-catering holiday accommodation on a range of websites with a great presence on Facebook, Twitter and other social media platforms not to mention the review website Tripadvisor. A Guide Price of 1,850,000 is being sought for Portnellan. For further information please contact CKD Galbraith's Perth office on 01738 451111.